FPA Blog: Why Invest in Landscape Lighting? Have you ever been out for a drive or an evening walk and noticed a beautiful home that you can’t help but admire? 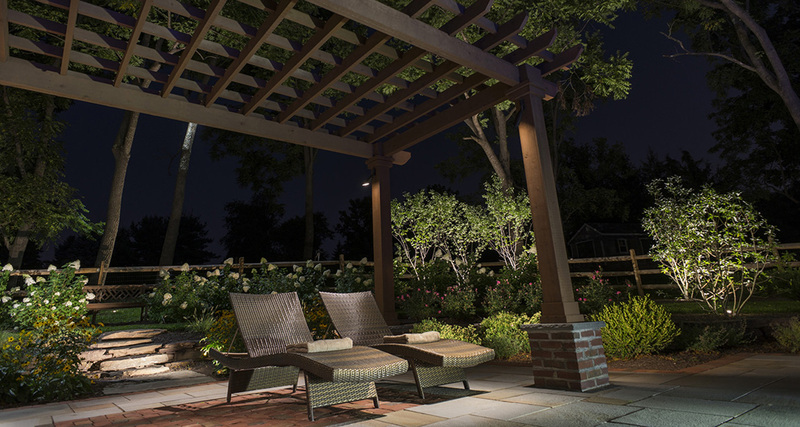 The one thing they most certainly have in common is a properly designed and installed landscape lighting system. Many homeowners have spent enough hours and money on their landscaping that they could have taken a nice vacation with their family, and yet only get to appreciate their investment during the day when the sun is shining. Why would you add value to your home with landscaping, and not be able to enjoy its beauty at night as well? This is just one reason to install a landscape lighting system. Not only can you highlight the trees, flowers, and shrubs around the home, but you can highlight the architecture and charm of the home itself. Create the perfect ambiance for outdoor entertaining with mood lighting around your pool or fountain, your deck, or your patio area. Aesthetics are not the only reason to install a landscape lighting system… How about enhancing security and safety? Statistics show that unlit homes are 3 times more likely to be burglarized than a home that is properly lit. Although lighting can't prevent crime, it will certainly make a criminal think twice about which house to approach, and more often than not steer him away from your well lit home. Do you have steps leading to your front door or connecting your driveway to your walkway? Lighting can prevent unnecessary accidents from tripping hazards by properly lighting a pathway and highlighting steps so that your family and guests can move safely throughout your property. A properly designed landscape lighting system is usually not a "do it yourself" project. There are many variables to consider like type of light, wattage, location, and placement just to name a few. You may have seen a home with deep shadows creating a ghostly feel, or poor contrast creating poor color replication for the home. First Priority Audio has the experience and training necessary to make these design decision for you and create the best landscape lighting system for your home. We have tried and tested several landscape lighting solutions, and we know the critical details that make a solid product. First thing to consider is whether to choose a line voltage or a low voltage system. Line voltage products require electrical wire that is rated for in-ground use or have a professional install proper conduit and wiring for your environment. This can get costly in terms of labor, not to mention the lighting fixtures themselves tend to cost more than their low voltage counterparts. Low voltage systems tend to be easier to install because the risk of handling the wiring is much less than a line voltage system. The wiring and connectors themselves are critical in a landscape lighting system as well. You want to purchase a product that is well insulated and water/air tight so that it can withstand the elements, especially in Ft. Lauderdale and Miami where humidity and water are a given. Next you want to consider the range of fixtures available with the system and make sure that there is enough variability to cover all the needs of your project, including type of light, size of fixture, and finishes to match your décor. Finally you want to consider the product warranty. Since your landscape lighting system will be in direct contact with the elements and affected by your landscapers and gardeners, you want to have a warranty that keeps your investment safe. Call First Priority Audio today at 954-650-3074 to have us design and install your landscape lighting system. Did I mention the products we have chosen to work with from Coastal Source come with a LIFETIME WARRANTY? Live near the water in Miami or Fort Lauderdale and are worried about saltwater damage? No need to worry… Our warranty covers that. Has your gardener ever broken a landscape light with their lawnmower? No problem… our warranty covers that too. We look forward to hearing from you.